To the east of the market town of Sleaford is the substantial village of Heckington, home to a unique eight-sailed windmill and an annual show dating from 1864. The bus route from Sleaford through Heckington to the Hales and Helpringham seems to have a somewhat complicated history. Thoughts about it were triggered by recently seeing some tickets of Sharpes Motors of Heckington. Leaving Sleaford to the east by the A17 road, passing Kirkby-la-Thorpe to Heckington, the route then turns south along the B1394 road though Great Hale and Little Hale to reach Helpringham. The latter village once had a railway station (closed in 1955) on the Sleaford to Spalding and Peterborough line. 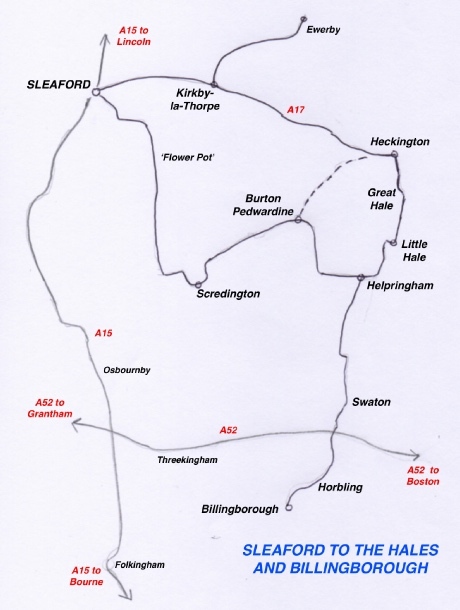 Richard Bray & Co. of Lincoln were running this route prior to 1930 when it was taken over by the Lincolnshire Road Car Company, becoming their daily route 36 Sleaford - Heckington - Helpringham. That route was also served daily by G J Saunby of Helpringham who sold out to the Road Car in 1933. 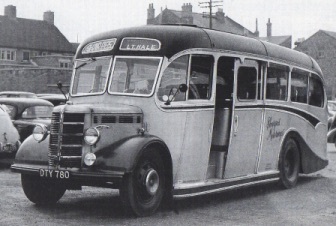 By 1977 (but after 1974) Road Car service 36 had been replaced by E V Wing of Sleaford (founded in 1954) who was operating the route six times a day at that time (weekdays only, but only five journeys on Thursday reflecting the early closing day in Sleaford). Wing also operated the ex-Gresswell route by an alternative routing from Sleaford via Scredington to Helpringham, then continuing southwards via Swaton and Horbling to Billingborough. A basic service of three weekday journeys was provided, increased to five on Saturdays; only two journeys ran on Thursdays, one of which was extended considerably further south from Billingborough through Pointon and Rippingale to Bourne for market day (see below). The Wing business, with garage in Mareham Lane, Sleaford, had grown by acquisition of the seven vehicle business of Charles Gresswell of Billingborough (previously based at the Robin Hood garage in Aslackby - a pub of that name still stands at the village cross roads. In 1930 Gresswell was listed as the publican). Five of Gresswell's fleet of seven were Daimlers. Wing had driven for Gresswell in earlier days and bought the business from him in March 1964. Gresswell founded and for many years carried on his coach and bus service, starting after the 1914-18 war, and in 1939 he built a new coach depot at Billingborough. His routes included Aslackby to Boston via Billingborough and Quadring on Wednesday and Saturday; Aslackby to Bourne via Kirkby Underwood and Stainfield twice on Thursday; a daily service from Sleaford via Scredington to Billingborough, extended via Pointon to Bourne on Thursday and Saturday; and a seasonal express run from Aslackby to the seaside at Skegness. 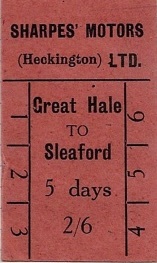 Former routes had also included Aslackby to Spalding on Tuesday until 1955; and Aslackby to Grantham on Saturday until 1957. Charlie Gresswell died in 1967 aged 74. In 1977 Wing was operating Billingborough to Boston twice on Saturday, a shortened version of the Aslackby to Boston route; and Aslackby to Bourne twice on Thursday; and the two routes from Sleaford to Helpringham and Billingborough. Also in 1977 Sharpes Motors of Heckington were still running a six times a day Monday-only market day service from Little and Great Hale via Heckington to Sleaford. In earlier years there had been a Saturday service also, as well as a route to Boston on Wednesday (until about the 1960s). 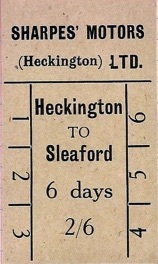 This brings us to the mystery of their tickets which include 5-day and 6-day weekly tickets for this route - the low monetary value of these weekly tickets suggest that this daily operation must have been many years ago (dates unknown); thoughts that these might have been for school journeys are rather negated by the availability of the 6-day ticket as well as a 5-day ticket. The Sharpes business, founded by J. Sharpe, became a limited company Sharpes Motors Ltd in July 1947. Variously known as Sharpes Motors or Sharpes Motorways, it was sold in 1983 to Mrs O'Byrne and her daughter and son-in-law Marie and Roy Greenslade but lasted for only a further six months following intervention by the regulatory authorities. The sole vehicle at the end was a 45 seater Duple Dominant 2 which was a tight squeeze through the passageway to the parking area at the rear of the premises. The base was was at 21-23 High Street, Heckington with garage behind. For some years Sleaford had been linked by bus to Bourne by way of the A15 road to Silk Willoughby and Osbournby; then onwards via Threekingham, Horbling, Billingborough, Pointon and Rippingale. Between 1961 and 1981 this was a jointly operated service between the Delaine of Bourne and Lincolnshire Road Car (service 34). Today service 34 exists only as a school day journey from Folkingham north through Osbournby to Sleaford; supplemented by a market day return journey on Monday and Friday from Billingborough and Folkingham through Osbournby to Sleaford (now Centrebus 35). Delaine cover the road from Billingborough south to Bourne but only on Thursday. On retirement in 2005 the Wings business was absorbed into Sleafordian Coaches (originally formed as a taxi business in 1964), who were already operating from Sleaford - via both Scredington or Kirkby-la-Thorpe - to Heckington and on through the Hales to Helpringham and Billingborough. Their 1998 timetable showed half a dozen weekday return journeys plus school-time services. It is not yet known when the bus routes passed from Wing to Sleafordian. The Wing's depot in Mareham Lane Sleaford did not pass to Sleafordian and was redeveloped for housing. The bus provision through Helpringham and the Hales in 2015 is by Centrebus circular route 37 (one return journey Monday to Friday) from Sleaford. The morning journey going out through Osbournby to Folkingham and Billiingborough; then Horbling, Helpringham, the Hales, Heckington and back on the A17 to Sleaford. 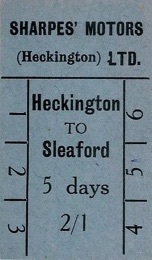 The route reversed for the return journey at lunchtime. This is supplemented on the route from Billingborough via the Hales and Heckington to Sleaford by services provided by Sleafordian Coaches on schooldays, plus a limited shoppers facility of one return journey Monday to Friday (with the inwards morning shoppers journeys of the two operators at very similar times). On Thursday (Bourne market day) the 1000 from Sleaford continued from Billingborough via Pointon and Rippingale to Bourne. Similarly the return journey left Bourne at 1400 and then formed the 1435 from Billingborough to Sleaford. The ubiquitous Bedford OB was particularly popular with operators in this area. ECT912 was new to Sharpe's Motors of Heckington in 1950 and subsequently passed to Kimes Coaches of Folkingham by 1982. After subsequently changing hands to several other operators it is now preserved in Anglesey in the livery of Jones of Llanfaethllu. Another of the Sharpe OBs (still operational in 1958 and pictured above) was DTY780; whilst inter alia Kimes also had EAY848, in service with them in 1953.